HD Audio recording anytime, anywhere with iPhone and iPad to record up to 24-bit 96kHz. 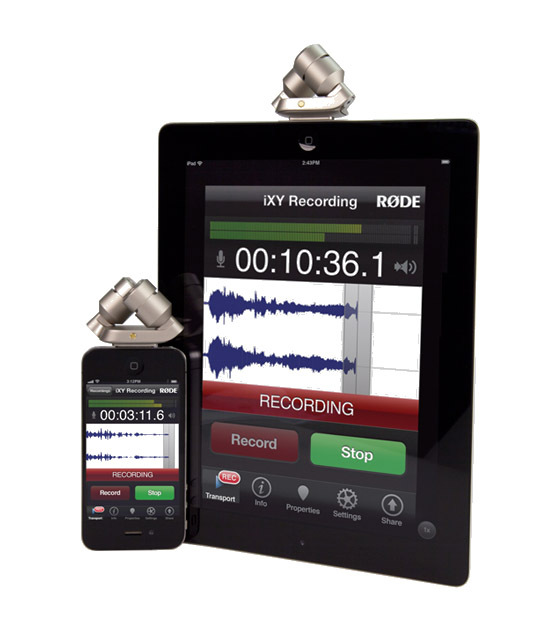 The RØDE iXY is the ultimate recording microphone for iPhone® or iPad®. With up to 24-bit/96k recording and on-board high-fidelity A/D conversion, your iXY recordings are rich, smooth and accurate. Designed as the ultimate companion app for the iXY, RØDE Rec turns your iPhone® or iPad® into a fully featured field recorder including encoding at 24-bit/96kHz, plus the ability to edit and share directly from your device. RØDE Rec is available on the App Store for $5.99. It will also work in conjunction with the 30 pin to Lightning Adapter.